A determined group of youngsters in Shaheed Nagar who started a weekly newspaper find their objectives are slowly being realised. When the first issue of the Navpratyasha Times came out in October 1991, its banner headline, which when translated read, "CORRUPTION RAMPANT AMONGST LEADERS OF SHAHEED NAGAR", made people sit up and take notice. The paper is brought out by some young Shaheed Nagar residents, originally street theatre activists, who felt the need for a regular forum for the locality's many problems and wanted to change the people and the environment. Solomon George, 29, a key figure behind the paper and presently its editor, explained, "The idea of a newspaper for our own locality had been with us for the last eight years. We felt the need because other mainstream publications deal mainly with problems too distant." Lack of money held up the idea till the Delhi Brotherhood Society, a voluntary organisation working in the area, donated Rs 25,000 to start the paper. An obsolete letter-press machine and an old typewriter was bought and the newsprint began to roll.Only George, with an M.A. degree in Hindi, had done a course in journalism. The others involved had no previous journalistic experience, but they had a firm resolve to use the paper to enlighten the people and improve their lot. Hostile response The newspaper first took up crime and anti-social activities, which ranged from petty thefts to drug trafficking. This provoked hostile reactions among the local goons. 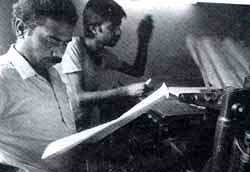 Siddiqui, a young reporter, narrated, "Smag was sold openly in Shaheed Nagar. We published an article describing the extent and nature of the problem and, using published information, police arrested many people. Some of us received death threats, but that did not bother us." Explaining their philosophy, Siddiqui said, "If we write something wrong, we deserve to be punished, but if we expose the truth and are persecuted, at least we will be called martyrs". This determination has had its effect. Residents of Shaheed Nagar claim anti-socials have begun to fear exposure by the paper. Even the local policemen have not been spared. A story on the corruption of an assistant sub-inspector led to his transfer. Health and sanitation are other areas of concern, with gastro-enteritis and cholera rampant in the colony. The newspaper regularly carries articles, with photographs, urging officials and the people to improve living conditions. The paper also carries a regular column on vocational training and job opportunities. Cynics point out the futility of a newspaper trying to change an already corrupt and decaying society. Hoshiar Singh, a RSS worker, said, "I used to subscribe to the paper, hoping for something new, but I was disappointed. I get all my news from Jansatta (a national Hindi daily). A small paper like this cannot do anything." But the circulation figures speak for themselves. Readership of Navpratyasha Times has risen from 300 to 3,000 within a year. Solomon said, "Today, people drop in at our press with articles they have written and with valuable suggestions." People are central in Solomon's scheme of things. With a print run of 3,000, he could easily go in for offset printing and cut down on time and costs, but that would mean loss of jobs for seven letter-press type-setters and technicians, all locals, working for the paper right now. The paper is available at a monthly rate of Rs 6, and despite its growing subscriptions, but is yet to enter the open market because of inadequate financial resources. Siddiqui says the owners of another paper once offered to buy all the copies from a hawker and remove it from the stands. The situation has left them vulnerable to pressures from vested interests. During the 1990 elections, the Congress (I) party workers made a vain attempt to buy the paper for Rs. 20,000 for use in campaigning. Recalling the offer, Solomon said defiantly, "We do not follow any political party or ideology, we are only working towards truth and justice, though we still have a long way to go before we achieve any substantial change in society. Ours is only a small effort in that direction."